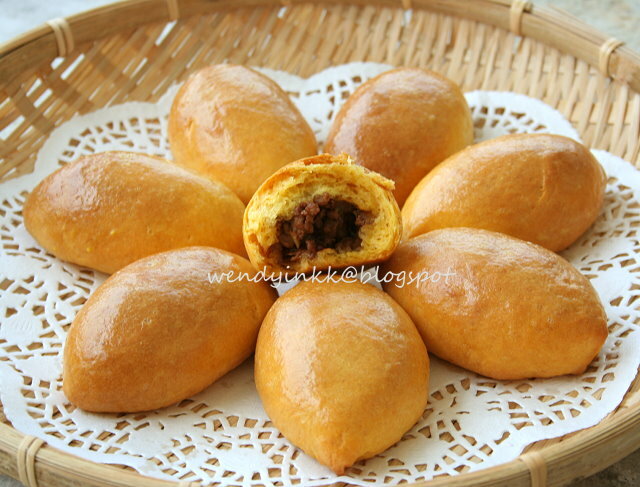 This bun is called pang susi, bun Susie, pan susie…. no matter how it's spelt, it's a special bun from the Kristang community in Melaka. No, there's no girl inside this bun, not a girl named Susie. 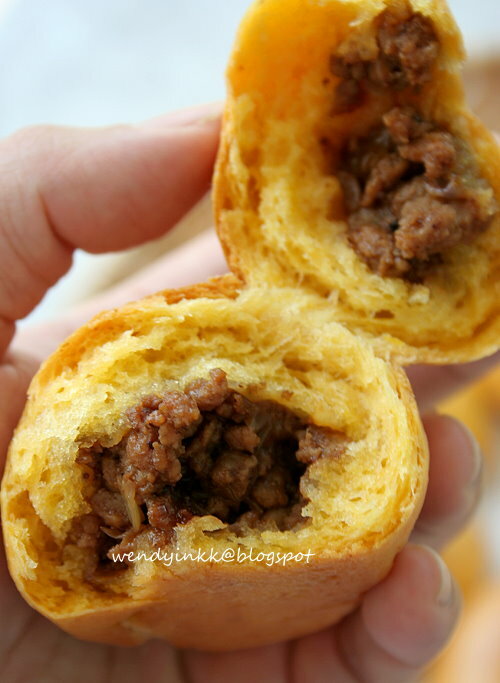 The inside is a sweetish spiced minced pork filling wrapped with sweet potato dough. Pang Susi is a Christmas specialty for the Kristang community (Eurasian). I only got to know about this special bun after reading up on Kristang on Wikipedia, just last week. Last year Dec, Her World magazine featured Pang Susi as part of the Christmas recipes selection. I think I saw that mag, but I brushed it aside, and I never knew where I saw it. Maybe at a mag stall. I can't remember. I posted on Facebook asking my friends to help me if they have this magazine and none of them have this mag. 600 friends and none buys Her World. Hmm... anything wrong here with the magazine? Anyway, Susan Lee-Symons came to my rescue and sent me a recipe in a Eurasian cookbook that she owns, in PDF format. Thanks Susan! I know there are other recipes found on some other sites, but after reading, they seem to sound nyonya like instead. 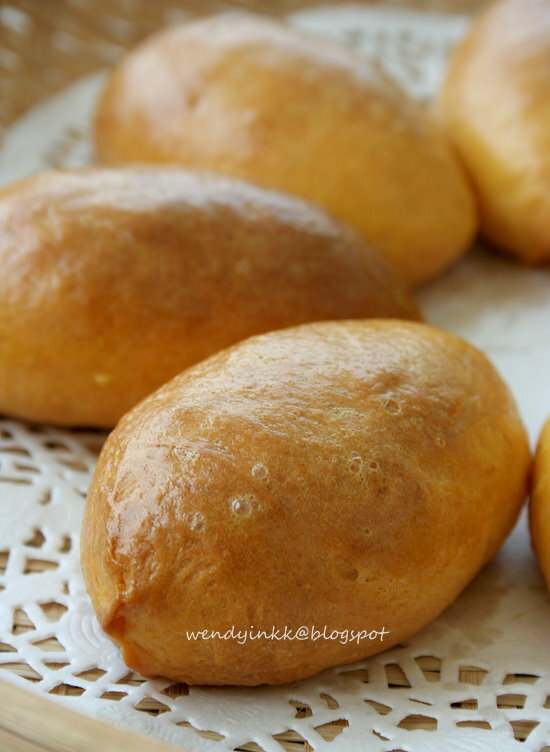 This recipe by a Eurasian seem to differ from those that uses winter melon or a bread dough as crust. I'm definitely going to try the Kristang version. The morning I made this, my hubby came into the kitchen right after I grind my spices (Yes, I grind them freshly with the mill), and he asked me what's that pong? Well, he's not a spice lover. 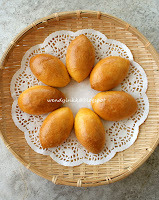 But after he had a few buns, he asked me whether I am going to make these again. LOL. I told him, minced pork 0 stock in freezer. He loved these despite the pong he smelled that morning. The spices didn't taste overpowering, instead, it goes very well with the meat. I did reduce it slightly to 1/3 tsp because my spices are freshly ground. Store bought ground spices will be fainter, hence you will need the original amount. I think I can cook the mince for dinner itself, as a condiment for plain rice porridge, yummy! But please have some patience when it comes to browning the onions, if the onions are not cooked enough, then it won't be as nice. You must let it caramelize a bit to bring out the best flavour. Personally these buns are nice, but I do find them a bit on the oily side. Maybe it's supposed to be like a yeasted pastry, more than a bread/bun, you know like that. Pastry not bread..... But it taste like bread. The method to make the dough is also like the shortcrust pastry method, but I added in some kneading although the instruction didn't mention it. I also let the buns proof for a while after forming, and that isn't stated in the recipe too. The recipe on the whole is pretty accurate down to the seasonings, except for the call for 2 large sweet potatoes. Large? That's pretty ambigous and some large ones can be up to 500gm each or 800gm each. Yes, I've seen really large ones before. Somewhere in the instructions, it is said to retain 200gm of sweet potato puree. I gave a sigh of relief. I'll just start with 250gm then, and of which is just 1 palm lengthed one. Is that big to you? It's just rather smallish to me. Puree weight lost is anticipated from the cooking, blending and scraping.. let's be safe that the required amount will still remain, but not excessive. Oh yes, please buy at least 350gm of sweet potatoes, and anticipate skin lost, or rotten parts. You won't know what you get, until you peel it. Slightly extra can be eaten. Adapted from: The Eurasian Cookbook by Mary Gomes. 1. Mix minced pork with spices. Set aside. 2. Heat a wok, put in oil and sauté onions until lightly browned. 3. Put in minced meat and cook until meat turns opaque. 4. Put in salt, sugar and caramel sauce. 5. Cook until there are no visible liquids, but meat should still feel moist. 6. Cool minced meat and freeze for 10 minutes or until meat is cold and firm. 7. Separate filling into 16 portions and shape each portion oblong like eggs (not like mini sausages). Keep chilled until time of use. 1. Cut sweet potato into chunks and boil (not steam) until soft. Drain and let it cool down. Puree and weigh out 200gm. 2. Combine flour, yeast and sugar together. Mix to combine. 3. Put in butter and rub it in, until everything looks like fine crumbs (I used the paddle attachment). 4. Put in sweet potato puree, egg yolk and milk. 5. Knead until a smooth dough forms. (I used hook attachment and kneaded on Speed 4/10 for 5 mins). 7. 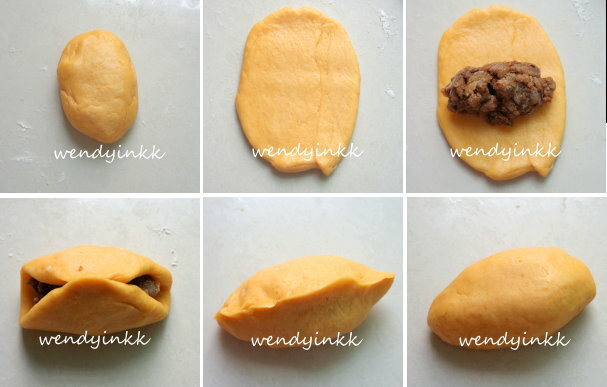 Separate dough into 16 pieces. Roll dough, wrap with filling and seal edges. (see picture). Shape the buns like rugby ball. 8. Let the wrapped buns proof for 30 minutes. Hi Wendy, this is something new to me. Must be yummy,yummy cos' there is nothing left for me. Guess I have to make my own, lol. Thanks for sharing. Oh, this is something new to me too! Never heard of this before. With the sweet potato and the meat filling, this must be real yummy as I like sweet potato. I got to make this one day. Thank you! Interesting...not heard of this before. I am really looking forward to your posts for this event. Looks like it's going to be an eye-opener even for the local people. Thanks for sharing and really admire your initiative to go the extra mile to put in the details! I am your fan! Interesting recipe. The amount is sweet potato is spat the same as the plain flour...I can imagine its not bread like for sure. But sure looks yum! Next time I go Melaka, where can I buy this? Haha...I wonder which one is easier, go there or to bake myself! I vaguely recalled seeing this in Flavours Magazine, Eurasian's specialty. When I first stepped into the working world, this was what we usually have for snack when we worked overtime. I remembered the supervisor told me that it was Susi Bun. It was filled with yummy tasting char siew. at first i thought they are like fried mantous cos they look so golden! Never heard of these and they do sound like a very special bun! I remember having these buns in the 80's at a church friend house. They are baba nyonya from Melaka. I always remember the cute name of it. 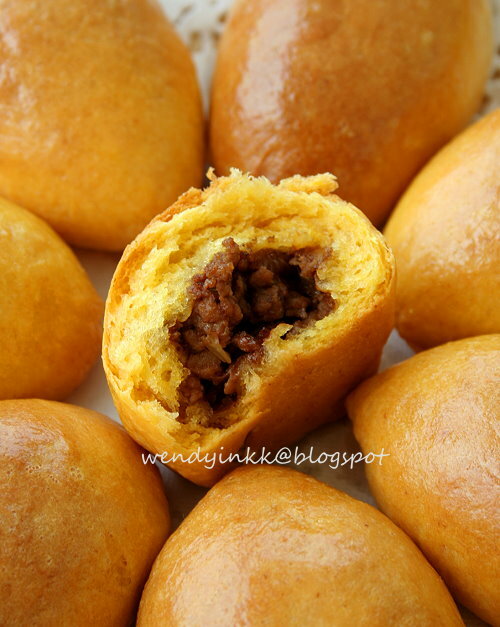 very interesting dish, I too have not heard or seen this before, see if I have the time to make this or not:D looks delicious with the minced meat filling my boys sure to like it. I wonder the butter can be replaced with cooking oil as some of my family didnt take butter. What is dark caramel sauce? Is there anything that I can subsitute it with? I'm not sure where are u from, but in Malaysia it's the common dark thick soy sauce that is not salty, Supermarket brands like Knife and Bidor Kwong Heng will have it. Wld like to ask your advice since u grind dry spices fresh using your mill. 1) What brand is your mill and how does it look like? 2) Can I use my Phillips grinder (comes as a set with the blender) to grind dry spices? i normally use it to grind wet stuffs like onions etc & I am worry whether I will "spoil" the blade. it's the same mill as seen on my almond butter post. I tried using my Phillips mill to grind the spices. But they came out coarse-like & not finely ground like powder. Any tips? Once I tried using my friend's Philip Cucina to grind onions and garlic to make sambal, weirdly, the result is coarse, like pounded. And the blade seems to be rather high up doesn't seem like it's small amount friendly. It's different than my National/panasonic mill that makes very fine onions and garlic paste. Hi Wendy, I'm wondering whether this bun is available in any stalls or bakeries? Not sure about it in Melaka. But you can try Eurasian restaurants.